Boy In Dining Car, a Norman Rockwell painting, appeared on the cover of The Saturday Evening Post published December 7, 1946. This is another favorite of Rockwell collectors, a classic enduring image of the world Rockwell painted. This painting was Rockwell's 243rd overall out of 322 total paintings that were published on the cover of the Saturday Evening Post. Rockwell's career with the Post spanned 47 years, from his first cover illustration, Boy With Baby Carriage in 1916 to his last, Portrait of John F. Kennedy, in 1963. This was also the seventh cover for The Post in 1946. In 1946, there were seven Norman Rockwell Saturday Evening Post covers published. The original oil on canvas painting, 38 x 36 inches or 96.5 x 91.5 cm, is part of the collection of the Norman Rockwell Museum of Stockbridge, MA. A charcoal, colored pencil and pencil on paper on board study, 38 x 35 inches or 96.5 x 88.9 cm, brought $241,000 at auction on November 28, 2007 at Sotheby's in New York City. It exceeded its pre-auction estimate of $80,000 to $120,000. The study was signed "To D. S. MacBride / Sincerely / Norman / Rockwell." Boy In Dining Car is also included in the traveling exhibition, American Chronicles: The Art Of Norman Rockwell. I was fortunate enough to see the original painting in person during January 2011 in Raleigh, North Carolina at the North Carolina Museum of Art. on page 172 of Norman Rockwell, A Definitive Catalogue by Laurie Norton Moffatt. Several studies also appear in the Norman Rockwell Catalogue on page 172. In this painting, Norman Rockwell shows us a young boy's first experience at figuring the tip for service received. We can assume that he received excellent service. The waiter appears to be an experienced server. Rockwell used a dining car provided by the New York Central's Lake Shore Limited as his background. Rockwell captured a moment in his own son's life that he thought would touch a familiar chord. Rockwell was inspired by Hablot Knight Browne’s classic illustration of a similar scene in Charles Dickens’ 1850 novel David Copperfield. Rockwell's father entertained the family by reading aloud passages from Dickens, and young Norman first experimented at art by drawing scenes from those readings. So Boy In Dining Car is coming full circle for Rockwell from his roots. The painting accurately describes a young boy's first effort at calculating his waiter’s tip. Some of us still have to get out our calculators to do that math. Rockwell, always the stickler for authentic detail, needed a real dining car to photograph and paint. The New York Central rail line diverted one of its dining cars to New York City for Rockwell's photo shoot. Rockwell, along with then ten-year-old son Peter went to the railyard for a model shoot. 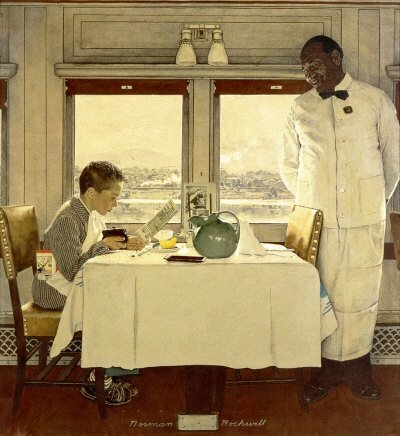 When he saw the dining car, Rockwell decided that the newer car, called the 20th Century Limited, looked too modern and did not posess the character he sought for the painting. He requested an older model dining car. As far as finding the ideal model for the waiter, the first three models interviewed also proved to be not suited for that role as Rockwell pictured it. The following week when the older car with more character arrived, so did his waiter. The waiter who arrived with the older car was a twenty-eight year veteran waiter. Now Rockwell had all the components in place and got down to work choreographing the photo shoot. The dining car was somewhat narrow. The photos taken to compose the painting could not capture the waiter or the background in a single shot. The photo session was taken during "the hottest day of the year," according to Peter Rockwell, who was chosen from four boys who had modeled for the role. Boy In Dining Car was only one of 322 Norman Rockwell Saturday Evening Post covers; Here is the list of Norman Rockwell Saturday Evening Post cover illustrations. The postcard with a picture of a train on it, visible leaning against the wall, was included by Rockwell to show his appreciation for the efforts of the Railroad. The train was the company's pride and joy, the 20th Century Limited locomotive. In addition the Saturday Evening Post credited the railroad in the caption for the painting. This was equivalent to $10,000 worth of free publicity for the New York Central railroad. Do You Have A Great Story, Opinion Or Contribution About Boy in Dining Car?